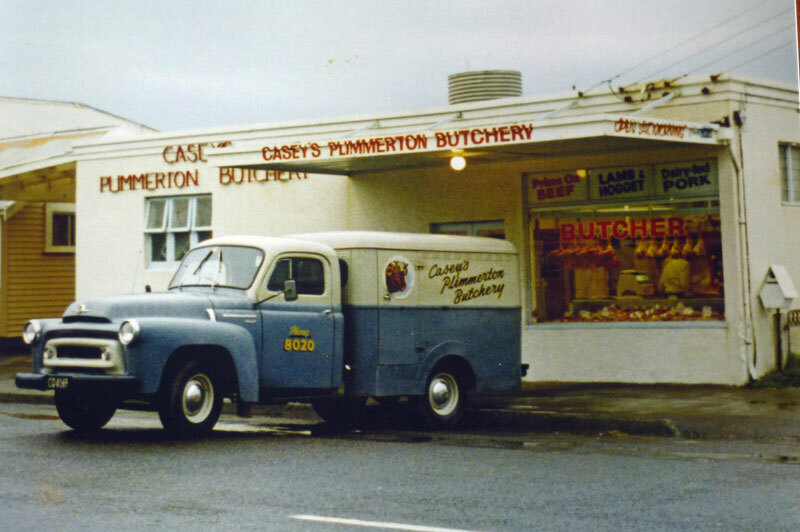 The Casey family were the suppliers of ‘Best Quality Meats’ to the Plimmerton district, including Paremata, Pauatahanui and Pukerua Bay. 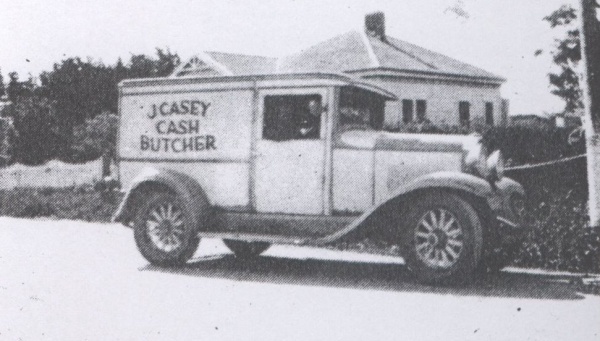 Jim Casey established his first butcher shop, J.P.Casey Butcher, at 26 Steyne Avenue. This was a property with a shop and accommodation for his wife Mimie and their five children. He later leased premises further north in Steyne Avenue. After the shops and Theatre Royal burnt down in 1954, the butchery was rebuilt very quickly. In the meantime the Caseys sold meat from their van. 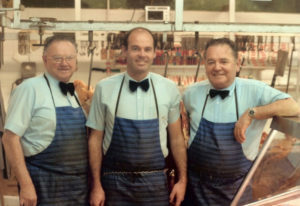 Jim’s sons Bill, Ivan and Erin and grandson Ron carried on the business until 1990. In the early years stock was slaughtered by Jim Casey at yards on Gray’s farm in Pauatahanui. Later Bill bought stock ‘on the hoof’ at Levin sale yards, or direct from farmers or stock agents, ensuring meat was of a high quality. From opening day, a delivery service was offered to the area, first to Pukerua Bay by horseback (a big basket carried on the front of the saddle, as in many parts of the country), then by Model T Ford which was eventually exchanged for the first delivery van, a 1930 Whippet. After obtaining a Hawkers Licence the butchers were able to cut and serve a full range of meat and small goods directly from the van to householders. And so the delivery route expanded. Later vans used by the butchers were the 1955 and 1957 Internationals which became well known around the district. The delivery service to Plimmerton, Paremata, Pauatahanui and Pukerua Bay was twice a week. The van horn would sound (very loudly) and customers would greet the butcher with their plates or roasting dishes to select their ‘cuts’. Pleasant memories of this era include the friendliness of customers, exchange of the latest joke, and offers of cups of tea especially on cold stormy days. The door-to-door service ended in 1974. A parcel delivery service using a 1976 Bedford van continued until the butchery was sold in 1990. 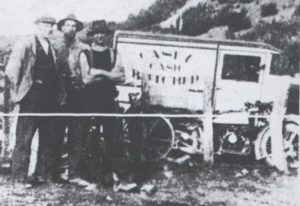 During the hard times of the Depression and World War II when meat was rationed and coupons were scarce, Jim Casey (with other Plimmerton businessmen and residents) was very generous to local families. There were always extras, especially sausages, ‘under the counter’ if you were lucky. Jim came from Otago with a sausage recipe which became legendary and it was said he made the best sausages in New Zealand. The shop was a real meeting place for locals. Mates gathered on their way to work or back to their farms (with bones for the farm dogs). Vigorous discussions sorted out the best rugby players and who should have won what! Morning tea at 9.30 saw many a customer out the back with a hot mug of tea. Children looked forward to visiting the butcher for their free saveloy, a big treat well remembered by many today. Although the butcher shop burnt down in the Plimmerton fire of 1954, trading never ceased. Business was conducted from vans until the new shop was completed at 8 Steyne Avenue. Tremendous efforts by local tradesmen saw the all-new Casey’s Plimmerton Butchery completed and ready for business in just six weeks. The Casey family took great pride in maintaining the tradition started by their father, Jim, with friendly service, cleanliness and top quality meat their priorities.